What if your breakfast had already gone on an adventure before you even got out of bed? 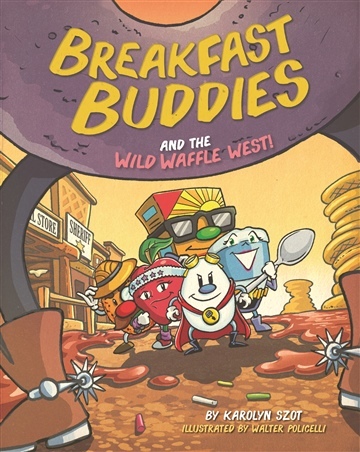 Join the Breakfast Buddies as they travel to the Wild Waffle West to put an end to the Junksters’ nefarious schemes. Can this super squad of healthy foods restore nutrition to the kitchen, or will the Junksters taste sweet, sticky victory? Karolyn Szot is a children's book author and TV director in Los Angeles. She directed the kids' shows Shushybye Baby and The Dreamsters. Her work can be seen on Netflix, BabyFirstTV, KidzBop Channel, and many other digital channels. Karolyn has always loved creating children’s content where kids can have fun while learning. She was born and raised in Tewksbury, New Jersey and studied film and television at Northwestern University outside of Chicago. Karolyn has fond memories of where she grew up but in all the places she lived she noted one major difference: the dramatic change in pizza! Her love for food and adventure helped her to dream up the fun and egg-citing Breakfast Buddies’ world and characters. After hearing the alarming statistic that one out of three children are considered overweight or obese, Karolyn wanted to create stories that inspire families to talk about health and exercise in a creative and fun way. She based the book’s characters on the United States Department of Agriculture’s MyPlate system, which focuses on all five food groups including fruits, vegetables, grains, proteins, and dairy.